Places To Have Yummy Pizza In Mumbai! Mamma Mia!! Are you living in Mumbai or going to relocate in Mumbai then you have to read this article related to Mumbai Yummy Tummy food places and Residential Apartment for Sale in Mumbai where you can live and enjoy these food joints. Mumbai, a city that hosts some of the best pizza joints in the country! Well, let us all confess this, that we all are bored of eating the same pizza at those fast-food chains, that basically serve a “typical” version of pizza! But when you are in Mumbai, wouldn’t you want try some authentic pizzas, the one that are made in wood fired ovens or some new tasty toppings? So, come sink your virtual teeth in as we take you on a yummilicious tour of Mumbai where you can enjoy some authentic pizza experience. Joey’s Pizza is one of the premier eateries in Mumbai for Pizza. The menu of Joey’s pizza is not just elaborate, but also worth experimenting with! Some of the must haves here are China Gate Pizza, Meats Pizza, Tornado Pizza, and Meat Ultimo Pizza. Where: 6 & 7, Upvan Building, DN Nagar, Andheri West. Little Italy is truly a feast for vegetarians! This restaurant has a pure veg menu and a wide variety of Jain options. A must try here is vegetarian pizza gourmand. Well, not only do they serve yummy pizza’s but also have a great ambiance where you can enjoy a great time with your dear ones. Where: 18 B, Hotel Atlantic, Near Maneckji Cooper School, Juhu Tara Road, Juhu, Mumbai. 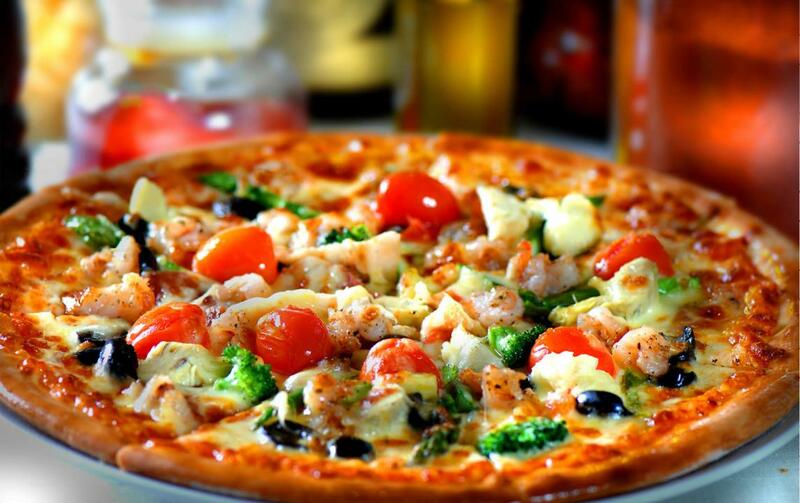 Pizza Express is one of the biggest pizza chains in Mumbai. This place is the safest bet you can try when it comes to having an amazing pizza experience. Must have collection here is the Romana pizza collection, this collection is sure to blow your mind off and will make you never ever want to step in those regular fast food pizza serving chains! What is better than munching on some mouth watering pizza and enjoying the ocean view, sounds like the perfect way to relax! Well, that’s exactly what you do here. A must have here is the Quad Pizza, where they serve you with three slices of Pizza of four different flavours all in one! Pizza Metro Pizza is known to serve metre pizzas and Pane Pizza is their most popular choice. Once you visit this place you will also notice that all the sea food lovers also order prawn based pizza, Frutti di mare, as it is called here. Well, do not forget to order the “Tiramisu” for dessert. Where: Jharna Apartments, Ambedkar Road, Pali Hill, Bandra West. Everything italian and a perfect place for veggies! The Restaurant totally sounds Mexican it is a vegetarian restaurant which is located at lower parel really has some great and vibrant ambiance here pizza’s are made in true italian type by using that special italian sauce and really fresh and remarkable buffalo mozarella cheese lets see the dish which i tried here. Quattro Formaggio pizza is a must try! Where: Located opposite to Phoenix Market City, Lower Parel. Other places with whats the best to try ! Where: Level 1 Phoenix Marketcity Kurla. 9) Pizza by the Bay: For the pizzas and for the view! Try the thin crust pizzas here. 11) Poptates: Not the quintessential pizza place. However, their pizzas are good. 12) Sorrisso Gourmet Kitchen: This is only for take-aways but their pizzas are awesome. 13) Shiv Sagar! : For the Indianized Pizza!